In a side street in Swindon town centre, there's a little Polish cake shop. It is, perhaps, one of the most incredible shops in the world, filled with the most amazing traditional Polish desserts, pastries, and pies. It's a bit like Willy Wonka's chocolate factory. The only problem is, visiting this cake shop makes me feel a little bit racist, and a lot ignorant. I can't even pronounce the name of the place, for goodness sake. Whenever I go into the shop, I spend a little while staring, slightly slack-jawed, at the counter of desserts. Everything looks amazing. Everything looks like something you want to climb inside just so you can eat your way back out. If it was labelled, I probably wouldn't know what the labels meant. And I'm British, which means I am not only ignorant, I am also proud. The last thing I want is for someone to think I don't know what I'm doing. As a result, every cake selection I have ever made in the shop is based entirely on aesthetic quality. Eventually, one of the lovely staff members asks what I want. I can't tell her, because I don't know what anything is. If I did know, I would probably horribly mangle the pronunciation, causing no end of embarrassment and insult. But I'm British, and therefore as well as being a bit ignorant, and a bit proud, I do my best to be incredibly polite. I sort of smile and point and try my best to indicate what I want. The staff member does her best to understand, and I invariably end up with something which isn't exactly what I wanted. But of course, I'm British. And I don't want to cause any offence by suggesting she picked up the wrong cake based on my ignorant mumbling and pointing. So I smile politely, and I leave the shop with my bright green jam-filled cake which is not really what I wanted because I'm not fond of jam and everyone knows red tastes better. But why am I talking about cakes? Because I'm hungry, of course. But also because I wanted to explain that in my day-to-day life, I really don't like to upset anyone, or cause a fuss, or accidentally (let alone purposefully) upset people. This may come as a shock to anyone who has read some of my more vehement reviews (Destination London ended up in my toilet, after all), but it's true. I don't like bringing negativity into people's lives, especially people I like, or who generally do good work (like the people at the Polish cake store). And that is why it is with heavy heart that I am writing a negative review of the Dark Darker Darkest Radioactive Expansion. The rules... Which may or may not be in your language. If you read my review of the base game for Dark Darker Darkest, you will already know I am a huge fan. 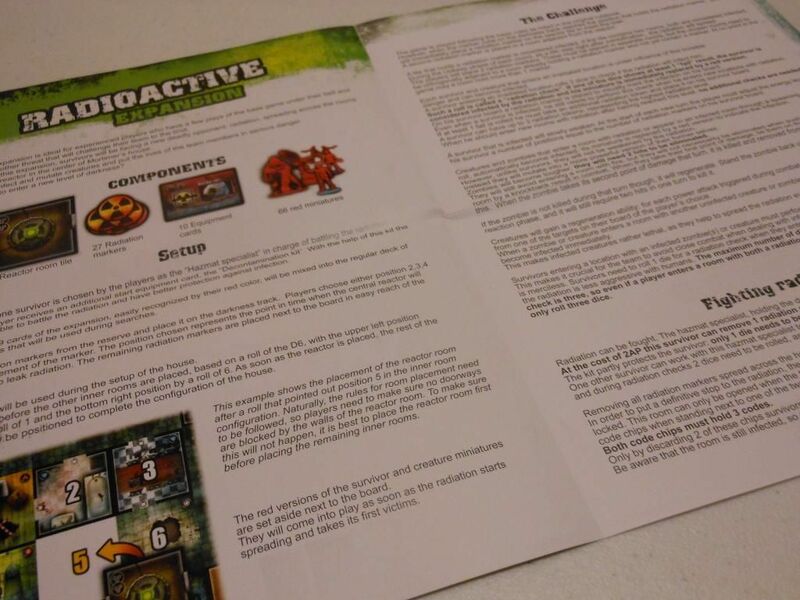 I love the game, and even assisted in working on a second edition of the rules to improve readability. I think David Ausloos has crafted one of the finest zombie games out there, and pushed the envelope with some of the design choices. I am a real sucker for a heavily thematic game that tells a good story. Playing Dark Darker Darkest is pulse-racing fun from start to end, and you are always left with something to talk about. Normally, that something is how the game ripped you up and chewed on your entrails. Which is my issue with the Radioactive Expansion. It takes a game that is already so hard it made Chuck Norris cry, and it turns the dial up to 11. This is an expansion that pushes the game from hard to so close to impossible that impossible had to take a paternity test. This is an expansion that you should only consider using if you think parachutes are for wimps. Now before you start shouting at me to "man up," let me break it down for you, then you can decide for yourself if I'm being a whining chicken. First of all, like the game itself, the expansion looks stunning. The artwork is incredible and deeply atmospheric, and really helps to create a kind of gritty, urban survival horror realism that is lacking from the more comical design of games like Zombicide. 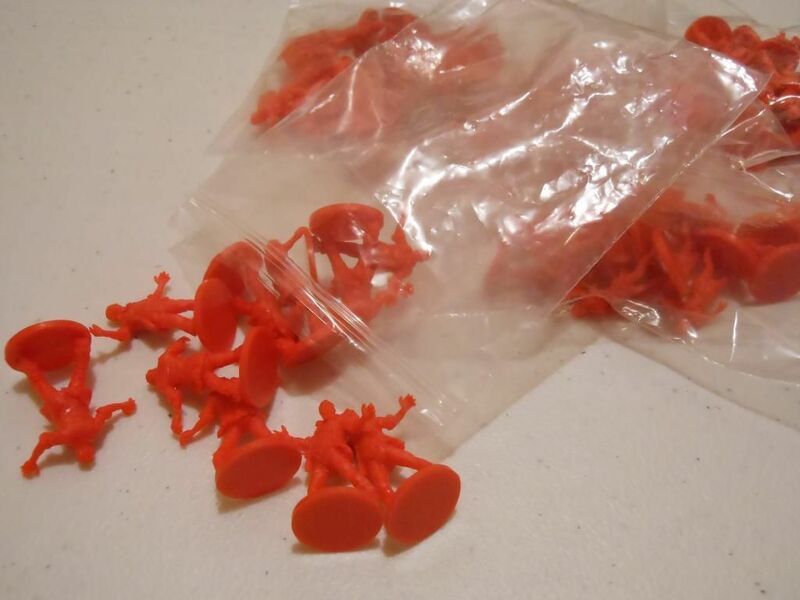 The expansion is housed in a small box which is the same sickly green shade as my Polish cake, and comprises red hero figures, red zombie figures, red creature figures, and red nemeses figures. These are of the same quality as the pieces in the base game, and are used to indicate when characters in the game become irradiated. 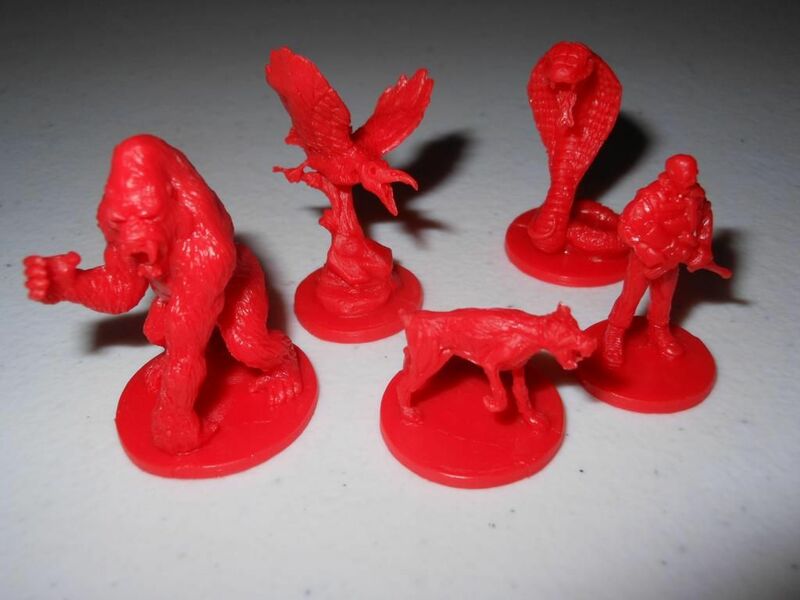 Of course, cardboard tokens to mark the original figures would have worked just as well, but I am not going to complain about getting more plastic. 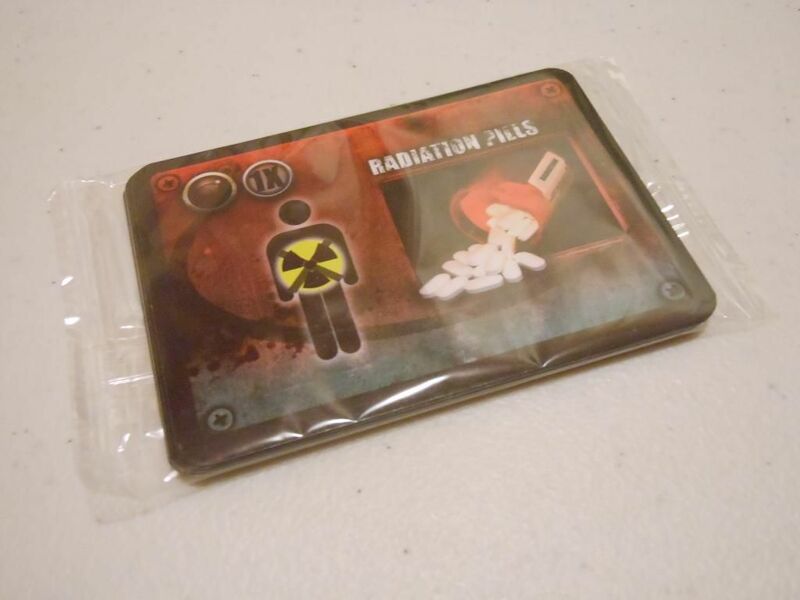 The only other components are a deck of equipment cards containing items for combating radiation, a reactor room tile, and some tokens for tracking the spread of the radiation. While all the graphics are great, and the miniatures are serviceable, there are tell-tale signs of the rushed, half-arsed way Queen Games handled this game. For example, the French language rules suddenly transition into English on the last page. However, for all that, the package is solid, if not overwhelming. What is far more exciting, is the potential this expansion brings: the opportunities to create even more cinematic adventures with your friends. The premise is that you add a reactor room to the game, which leaks radiation. Over the course of the game, radiation spreads through the house, mutating zombies and creatures to make them stronger, while weakening the player characters. It is a really exciting idea, and works well with the theme of the game. You have to admit, the thought of regular zombies suddenly mutating into stronger, faster monsters is pretty neat. However, the problem is that there is nothing to offset the added difficulty. Zombies get tougher. Creatures get tougher. Players get radiation sickness and start to lose energy every turn. 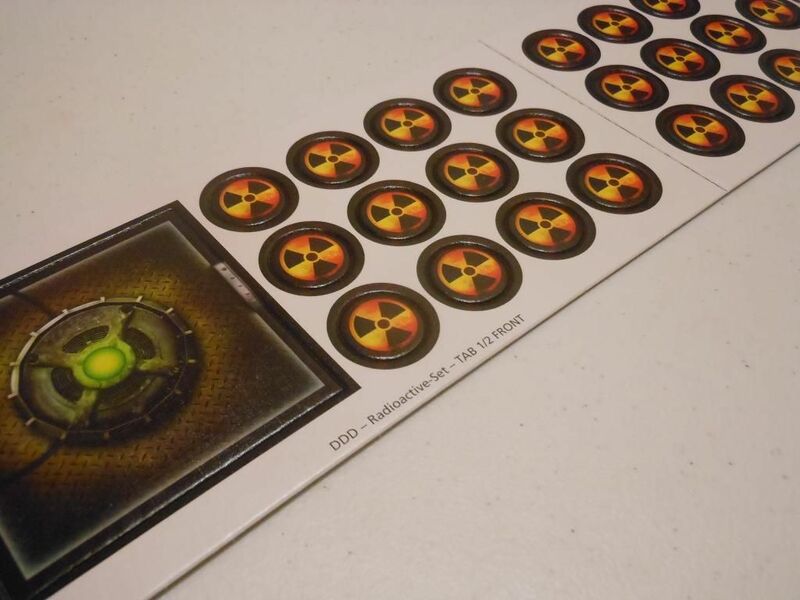 As the game progresses, the radiation spreads further, and any irradiated playing pieces can pass on the radiation to any other pieces they come in contact with, which means the radiation rapidly gets out of control. The expansion just piles on the hurt. Gorilla is auditioning for a coke commercial. Now, I know what you're thinking: There must be some way to fight the radiation. Right? Well, yeah. You can close the reactor down. It's easy really. All you have to do is use action points to access a terminal, discard two of your hard-won code chips (each of which must have three codes on it), enter the reactor room (taking radiation checks as normal), then spend another three action points to shut down the reactor. It is so bloody difficult to shut the reactor down, if you focus on trying to do it, you will almost certainly run out of time before you get a chance to actually win the game. Besides, shutting down the reactor does not remove radiation that already exists in the house, and as creatures that are already irradiated spread the radiation anyway, shutting down the reactor is almost pointless, as you are still going to be facing a lot of mutated monsters, and still potentially losing health to radiation sickness. Sure, the expansion includes some new equipment to help, such as radiation pills and hazmat suits; but this is just another disguised kick in the balls, because every new equipment card has a single black code lock icon. If you kit up with radiation suits and pills, you will not have any of the colour combinations you need to unlock any bloody doors. Remember kids, never eat radiation warning signs. It pains me to say it, but I cannot recommend this expansion at all. Dark Darker Darkest is a finely crafted game that I highly recommend, but it is tough to beat. It is a fun challenge. It is frustrating, and you can get hosed by bad luck; but it can be beaten. Adding the radiation rules is a game changer, and not in a good way. If you really, really have the urge to make your life as difficult as possible, this expansion is a safer alternative to skydiving without a parachute. But it's not for me. I like my expansions to add new challenges, and new ways to overcome those challenges. It sounds like the designer of this game needs to expand his creative team. These issues sound like a one man show is coming up with all the ideas and then letting family/ small group of play testers have-at-it. The game has good foundation. shoot this idea to the designer.. For the next expansion release new tiles. Lab tiles. The story can be, The players have stumbled a cross a secret entrance to a under ground lab, under the house. ( Hmmm, ring any bells) as an add on, he can make 2 or 3 new heros. military, FBI anything with a cool look. I'd love to help out any way I can. PS tell him to redesign the Multi-tracker board. David is very thorough. 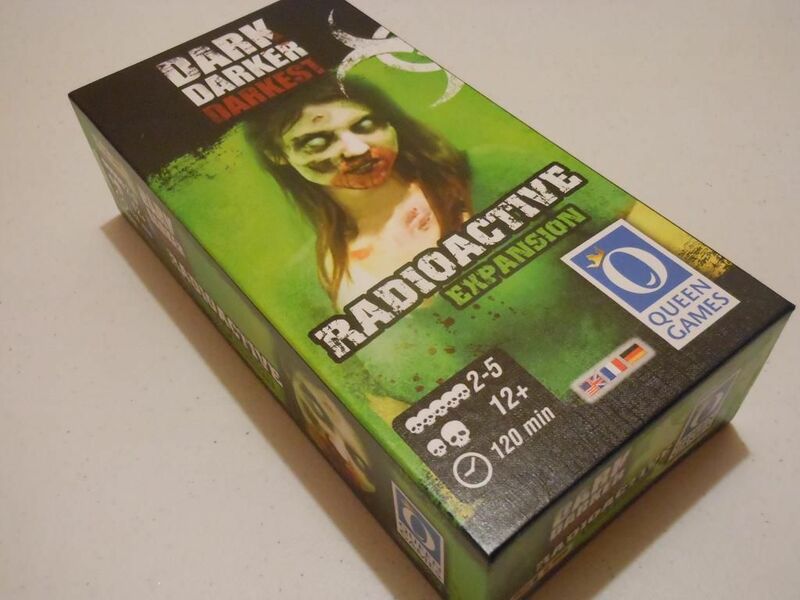 Dark Darker Darkest was in development for years, and I know it went through a lot of playtesting and refinement. I think (I do not know) the big issue is that the game wasn't necessarily a good fit for Kickstarter, and there was a rush to add additional game content to provide stretch goals in a very small timeframe. As for new expansions... Unfortunately, Queen Games seem to have given up supporting the game, and they even cancelled an expansion that would have introduced new characters, zombie bears, and a giant spider. I doubt we will see any new content, but I have certainly been wrong in the past.